Hello there and a happy Monday to you! Well, it’s the start of another week and that means another new sketch over at From the Heart Stamps. This week not only did I stick to the sketch I also included the ‘twist’ – to add some nature! I hope that you will join in with us and upload your creations – using a FTHS image of course, by the 24th of January. Everyone who enters will receive a $1.00 voucher to the store and a random prize will also be awarded. Challenge rules are HERE. This card will be for my Mum from my niece and nephew for Mother’s Day (yes I’m am rather ahead of myself aren’t I?!! This won’t last!) I also made another one – same design just slightly different colour scheme. That one will be for my sister’s mother-in-law again from my niece and nephew. I actually ran out of the pink paper in the first card so had to stick with the green and lemon here! I love these papers though – they just shout ‘spring’ to me! 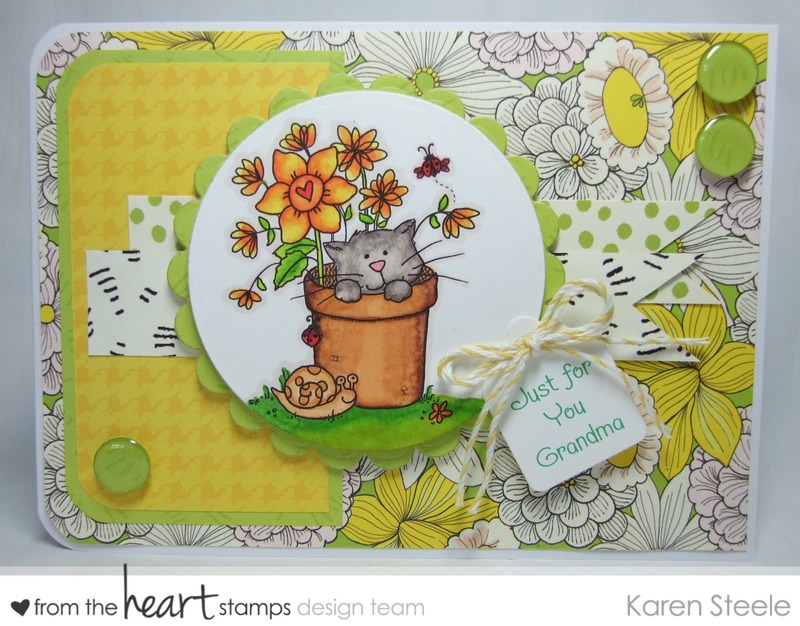 Supplies used: Anna Griffin – Fifi and Fido papers, Spellbinders tag die, Spellbinders Circle and Scalloped Circle Dies, Epiphany tool, twine, WRMK Corner Chomper and Spectrum Noirs to colour. Next > Tanya – Snowball Fighter! Beautiful cards, Karen! Those papers are so happy and bright. Yes, they definitely look like Spring! This a perfect grandma card! The colors and papers are so pretty! 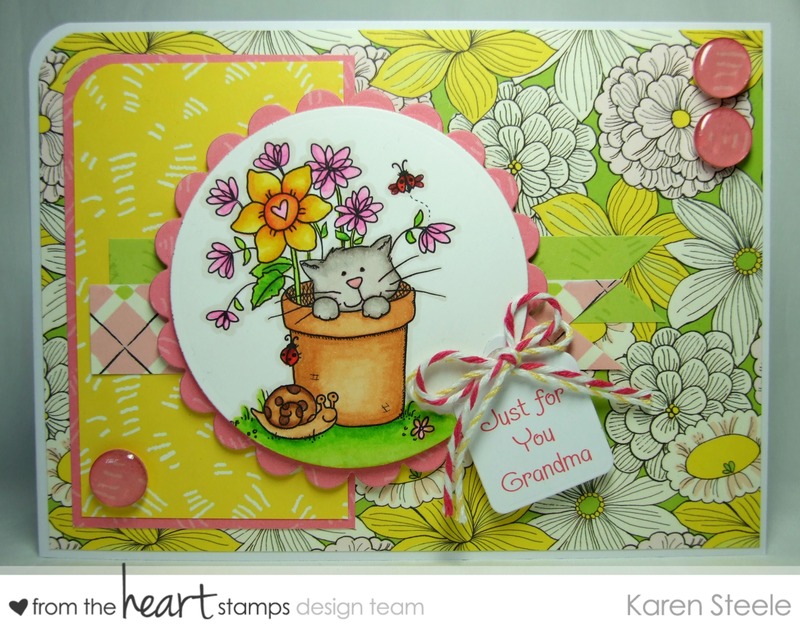 Your sweet card certainly does shout “spring” with the lovely colors! Such a darling kitten in the flower pot! It’s a wonderful Grandma card! Its só true!!! I love it! Its realy beautiful! The Kitten is adorable! Such sweet cards, Karen! I’m never ahead – good for you! These are both fantastic Karen!! I’m never ahead either…last minute Lucy is me!! Karen, this card just makes me smile ear to ear! It’s so happy with all the wonderful colors (and coloring) and the darling image. LOVE IT! Both cards are adorable, Karen. The floral dp really caught my eye. Beautiful Spring colors!